After Wayne State and Ohio State, has campus policing become more dangerous? After the killing of a Wayne State officer and the attack at Ohio State, campus police reflect on dangers of the job. 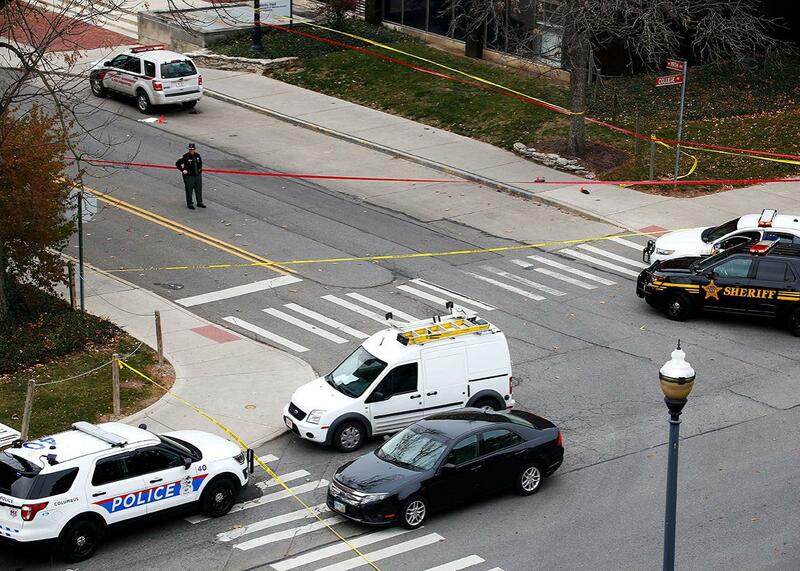 Police keep roads closed following an attack at Ohio State University on Nov. 28 in Columbus, Ohio. Hundreds of police officers and police dogs lined the street outside Detroit’s Ford Field on Nov. 30 to honor the Wayne State University police officer who died on Nov. 23. Inside the stadium, the officer’s body lay in a casket as one of his own police dogs stood nearby. The officer, Collin Rose, was shot on Nov. 22 while conducting a traffic stop in a neighborhood near campus. “As police officers, we’re trained to prepare for any incident, except one: losing a fellow officer in the line of duty,” Anthony Holt, Wayne State’s chief of police, said Dec. 1 during Rose’s funeral. At the funeral and other memorial services, Rose was praised for his work with local elementary school children, his “trademark smile,” and his willingness to travel on his own dime to police officers’ funerals. He named one of his dogs, Wolverine, after the nickname of an officer whose funeral he attended. Rose, who was 29, was also described as a longtime friend of the local animal shelter where his fiancée worked. When he died, the officer was just one credit short of earning a master’s degree in dispute resolution—a degree that Wayne State will now award him posthumously, along with a promotion to sergeant. Rose is the first Wayne State police officer to die while on duty, but his death is one of many recent incidents that college police say serve as reminder of how dangerous the job can be. On Nov. 28, an Ohio State University student, Abdul Razak Ali Artan, drove a speeding car into a group of pedestrians outside a classroom building before jumping out of the vehicle and stabbing several people with a butcher knife. Eleven people, mostly students, were injured in the attack. All are expected to survive. An Ohio State police officer, Alan Horujko, was near the scene at the time, investigating reports of a gas leak. Within two minutes of the student’s car jumping the curb, Horujko shot and killed him. “He engaged the suspect and eliminated the threat,” Craig Stone, Ohio State’s police chief, said Nov. 28. University and U.S. officials have not yet confirmed Artan’s motive, but Josh Earnest, White House press secretary, said Nov. 29 that the student “may have been motivated by extremism and may have been motivated by a desire to carry out an act of terrorism.” The Islamic State also claimed Nov. 29 that the student was inspired by the terror organization. Calling the student “a soldier” of Islamic State, the group said that he “carried out the operation in response to calls to target citizens of international coalition countries.” The organization, which released the statement through its news service, did not claim to have advance knowledge of Artan’s actions, though it has repeatedly called on its followers to conduct independent “lone wolf” attacks. A similar attack took place last year at the University of California–Merced. Over the course of 15 minutes, Faisal Mohammad, a first-year student, stabbed two other students, a university staff member, and a construction worker. Campus police chased Mohammad to the university’s Scholar’s Lane bridge, where they shot and killed him. In March, the FBI announced that the student was acting alone but had been inspired by Islamic State. In July, two officers at El Centro College were shot and injured during a deadly sniper attack on Dallas police. The El Centro officers were guarding the entrance to the college when the sniper shot out the glass doors. One officer continued to help defend the college with bullet fragments still lodged in his stomach. In 2014, a former Florida State University student opened fire outside the university’s Strozier Library, injuring three people. Hundreds of students were inside the library when the man, Myron May, began shooting outside the building with a semiautomatic handgun. May then entered the library, shot a student library employee, and reloaded his gun before returning outside to face police. Police and the gunman fired more than 30 rounds at one another before May was shot and killed. A year earlier, a police officer at the Massachusetts Institute of Technology, Sean Collier, was shot and killed in his patrol car by the two men responsible for the Boston Marathon bombing, which had occurred earlier that week. Collier had been responding to reports of a disturbance on campus, which turned out to be the Tsarnaev brothers. Thousands from MIT— and police officers from throughout the Boston region— attended a memorial service for Collier, who was 27 when he died. In the past decade, campus police officers have gained new legal authority and have become increasingly armed. According to a report released in January 2015 by the Bureau of Justice Statistics, nearly 70 percent of colleges and universities in 2012 operated full law enforcement agencies with sworn police officers. About 94 percent of those officers were authorized to use firearms. In total, 75 percent of campuses said they used armed officers in 2012, compared with the 68 percent of colleges when the survey was last conducted in 2005. At the same time, college campuses are among the safest locations in the country and were so even prior to the increase in armed officers. The same Bureau of Justice Statistics report found that campus agencies recorded 45 violent crimes per 100,000 students in 2012. A separate report found that, between 1995 and 2002, adults between the ages of 18 and 24 who were not enrolled in college experienced 24 percent more violence than college students. But Burba, president of IACLEA, said that the attacks at U.C.–Merced, Florida State, and Ohio State demonstrate why college police can’t let that perception of safety lead to complacency. Increasingly, through memorandums of understanding signed with local law enforcement, college police are also called on to patrol and protect areas surrounding campus. That’s what Rose, the Wayne State officer, was doing when he was shot in November. This blurring of jurisdictional lines has led not only to campus police protecting more people on and off campus, but has also helped place them at the center of national debates. Last year, a University of Cincinnati police officer followed a car off campus before pulling it over for not having front license plates. Within minutes, the driver of the car— an unarmed black man—was dead. The officer, who was white, had killed the driver. The killing sparked protests on campus and across the city. The officer was charged with murder, but a jury was unable to reach a verdict in November, and the judge declared a mistrial. A date for a retrial has not been set. Since the shooting, the university said it “has engaged in voluntary reform of its police department, which, to date, has included a top-to-bottom review of all policies, practices, procedures and training; new leadership; and the creation of a Community Advisory Council to help guide reform efforts and provide input” from the local community.